Motivate Canada is a Canadian charitable organization which specializes in Youth Driven Development™ (YDD) – a powerful youth engagement and leadership development framework that taps into the natural optimism, energy, passion and innovation potential of young people to make a positive contribution to their communities. Since its inception in 1994, Motivate Canada has worked to introduce YDD opportunities into the lives of over 2 million Canadian youth. From modest beginnings as a one program provincial organization, Motivate Canada has expanded its reach and now delivers three core YDD programs across Canada, in addition to several provincial initiatives. Contribution: becoming civically minded and wishing to contribute ideas, time, skills and energy to the community. Motivate Canada envisions a world of empowered youth who are active, healthy, confident, community-minded and inspired to lead change in their communities. In partnership with like-minded organizations, Motivate Canada incubates and implements youth-driven development initiatives that empower this country’s greatest natural resource – young people! 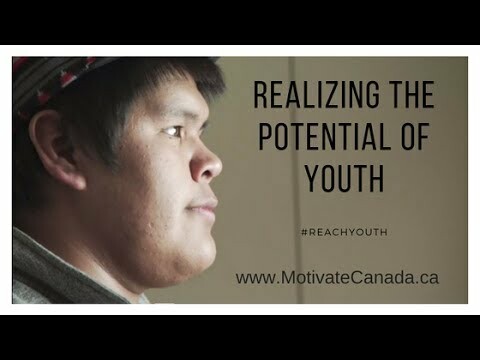 With your support, Motivate Canada can continue to pursue this shared vision to reach more youth, in more communities, to realize even greater impact. "“I honestly couldn’t think of another organization that I would want the donation to go to that truly has made an impact (a real life changing impact) on the lives of so many youth. I say that with full confidence as I know many of the youth who have changed their lives because of Motivate!”"
"I can’t thank the GEN7 Program enough for what it has done for [my community] to be honest. ... This group of kids who hardly knew each other before are best friends now and teammates and they love when visitors come to the community so that they can show them what they have learned. " "Our youth are this nation’s greatest natural resource, and our unique value is cultivating a social infrastructure that supports the positive, community-changing energy that already exists within them. We aren’t inventing a cure for young people. They are our cure. " "It’s so important to young people to have someone positive to look up to. It’s especially important when it’s someone that they can relate to, someone who has overcome the same struggles that they are facing or will face."